This node sets the scale and offset of the mask. To add a Scale & offset node, right click in the Graph Editor and select Create Node > Mask Transformation > Scale & offset. 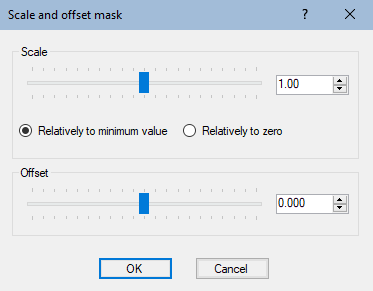 Use the Scale slider to change the scale of the mask size. Relative to minimum height: Minimum value of the mask heights does not change. If the mask heights are between -20 and 80 (range 100), and with a factor of 2, the heights are between -20 and 180 (range 200). Relatively to zero: Zero heights do not change. If the mask heights are between -20 and 80 (range 100), and with a factor of 2, the heights are between -40 and 160 (range 200). Offset: Sets the positive or negative offset to apply. Relatively to minimum height Minimum value of the mask heights does not change. If the mask heights are between -20 and 80 (range 100), and with a factor of 2, the heights are between -20 and 180 (range 200). Relatively to zero Zero heights do not change. If the mask heights are between -20 and 80 (range 100), and with a factor of 2, the heights are between -40 and 160 (range 200). Offset The offset (positive or negative) to apply.